NY: Knopf; 1999, 304pp. ISBN: 0375406492. This book’s proper title should be The Book and the Bookshelf : and How they got that way. Most bibliogeeks recognize Petroski as the scribe of the 434 page ode to the lowly Pencil. This book traces the evolution books storage from the scroll cabinets to modern libraries with shelving so strong that it supports the actual library not just the books. Basically a long monograph with only 226 pages of actual text, even padded out with appendix, notes, bibliography and index it is not as long as the Pencil. But how can a true bibliophile NOT like a book that spends 19 pages of the appendix talking about 25 different ways to shelve books? Don’t get me wrong, those 226 pages are thick with bibliohistory and illustrations that can’t be found easily other places. Petroski heroically distilled more than a millenia of history into a conveniently portable package. Laying it on a bit thick for a one sit read . 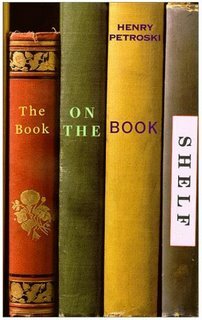 . . both the hard and softcover can be scrounged up for under $5 so I can definitely see it getting picked up and read, it it were say . . on a shelf near the water closet?